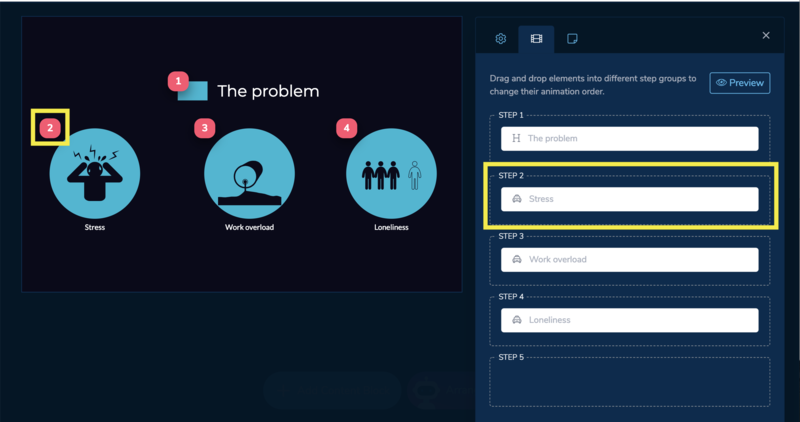 In order to manually dictate what elements show up first in a slide, go to the Design Editor and hit the Animations button, next to the slide. You'll notice each element on the slide is tagged with a number, it indicates its place in the appearance sequence. If all elements are tagged with number 1, it means they will all show up at once. You'll notice all elements are inside the "Step 1" box. In order to change the elements order, just drag and drop them from "Step 1" box, to "Step 2". Consecutive steps will be added automatically for you to drag and drop elements accordingly.